Have you heard of the HTC One Mini? Just like Samsung is milking its flagship branding for phones small, large and with optical zoom, HTC might be releasing a scaled down version of its 4.7-inch flagship too. Bloomberg regurgitates the speculation we've heard on it so far, such as a 4.3" display with lower resolution than the parent, which on that screen size would still be swell, and a slower Snapdragon processor. The business publication, however, also confirms the One Mini to "go on sale by August". Given that the HTC One has Full HD 1080p display and scorching Snapdragon 600, if the HTC One Mini sports "just" HD 720p screen and Snapdragon 400, for instance, it would still be a great midranger. That's especially if it comes with an UltraPixel camera, as rumored, and the BoomSound dual front stereo speakers, which is expected as well. The only variable is the price, but if it's in the $400 ballpark sans contract, HTC might have a veritable hit on its hands. I've said it twice and I'll say it again: This is how you do midrange. Bravo, HTC. 720p and dualcore processor is high end if the iohone 5 is considered high end. there isn't anything separating it. It is just the Apple koolaid at work that makes people call this mid range. Until you can fit 1080p into 4.3 and a Qualcomm 600 can run on something less than 2300 mah, this is about as high end as you can go for compact phones. Android fans seem oblivious to this fact. Sure the Z10 has 768p but no one wants that aspect ratio. Nokia is leading in Windows Phones Samsung is leading in High-end phones HTC will now lead Mid-range phones Good :) LG and Sony are learning (y). This won't make much of a dent in Apple sales, but it'll provide a strong alternative. Heck if they steal even 10% of iPhone 5 sales, it would be a windfall for HTC. Nothing is going on kiddo. Samsung failed on midrange.......HTC One Mini >>> Samsung Galaxy S4 Mini. 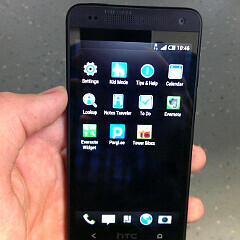 HTC FTW! Good job HTC! Now you can't thumb me down plastic fans! Hahaha! Even galaxy s4 sell more than HTC One But HTC one mini will sell more than s4 mini.. BEWARE!! Samsung fan has gone full retarded! Be safe. HTC mini with 720p 4.3 inch is a great deal but... $400!! It should be less than $350. Apple Iphone 5. Below 720p 4 inch 1gb of ram Dual core processor. $649 Sure IOS costs more than sense, anything does, even WP8 and BB10. And the iphone has a nice GPU. Plus the home button is in the right place, but that is about it. $400 is fair, as long as the buttons works, there are no gaps, and the volume rocker doesn't rattle. If it has anyone of those though, then it is HTC failing hard, again. Surprise surprise. looks awesm! I wonder how it compares with the xperia sp. whichever wins will be my next phone. i think xperia sp has the advantage of the adreno 320 gpu. this htc one mini however will probably have better display (if they use the slcd panels) build materials and don't forget the 2gb ram and boom sound. HTC One mini for $400. You can buy the Nexus 4 for $299. So why bother. If I was going to BYOP, the Nexus 4 would be my choice. Simple reasoning would be because the Nexus 4 is short and fat and big. If you don't mind the size though, Nexus 4 hands down. I honestly don't listen to music without earphones on my phone nor do I watch movies in public, kind of a waste of space those speakers and amp. Unfortunately, if those leaked pictures are correct, the HTC One mini isn't that much smaller than the HTC One which would put it in the same size category as the Nexus 4.